Levanessa Meran is a special patient from Sister Babs’ Inn of the Good Samaritan, who we have been treating for four years. She was born with a large hemangioma (blood vessel tumor) of her upper lip, and because this is a very vascular (bloody) condition, it required conservative injections to decrease the size until this year. This year, our surgical team helped resect the majority of her tumor, restoring some normalcy to her face. In the recovery room, most of us did not recognize her (even her mother) because she didn’t look like the same young girl. Her normal-appearing countenance amazed us and made us weep. In March of 1985, in a remote village called Las Martas de Farfan, on the Haitian border in the hills of the Dominican Republic, a young Peace Corps volunteer visited our clinic inquiring whether he could help a potential patient he had met in the hills. Francisco Ventura was a 40-year-old man, a loner and hill farmer often ostracized by the local village because of his physical appearance. The Peace Corps volunteer thought the man had an ax wound to his mid face, with his nose, lip and face all spread apart. 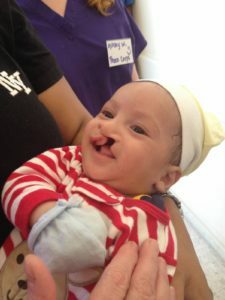 He actually had a wide complete cleft lip and palate deformity, so our first team in the Dominican Republic repaired him. He returned the next year to have his palate repaired, and although he remained a bit of a loner, he was accepted and finally loved by his community. They thought he would never be normal. The Peace Corps volunteer returned to that site 15 years later to find Francisco healthy, happy, and gregarious. During the first medical mission, the team treated Malay Valenci, an 8-year-old girl with a cleft lip and palate who lived in the mountains near the Haitian border. The child had never seen an electric light nor had she been to the city. Her mother took the child out of the small village school as she was taunted by the other children because of her deformity. Her lip was repaired one year, her palate the next, and she subsequently became an outgoing leader in the school from which she had been removed. Seventeen years after her repair, she wrote us a letter, thanking us for changing her life and letting us know that she had opened a small clothing store in a nearby village, was married, and had a baby without problems. The Ramirez family arrived together and they all had various congenital hand deformities, i.e. polydactyly (too many fingers), syndactyly (webbed fingers), and various digital malformations. They eventually had all of their hand deformities operated on and their problems were solved. In the Dominican Republic, Raul Florenteno, a 7-year-old boy, had suffered severe facial and hand burns while in his crib as a baby and barely survived. At the age of 2, he was left in a poor orphanage by his family. Over the years, he was shunned by his fellow orphanage children because of his severe facial, hand, and arm deformities. The owners of the orphanage and their donors were most loving to Raul and brought him to our clinic. 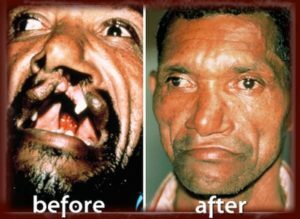 His left face was so severely burned that his mouth was incontinent and turned down to his chin. His left eye was exposed due to severe scars of his lower eyelid and cheek, his left arm pit was completely stuck to his chest, and his left hand was functionless, like a mitten. Our team improved his facial deformities with grafts and flaps and gave him some function to his fingers and arm. He never complained and only had tears rolling from his eyes when we changed his dressings. At the end of the two weeks, he was more active and had healed well. He will be back each February for more surgeries. With his display of courage, he has become a favorite at the orphanage. Maria Teresa Vannuz was seen in February 2008 at the Padre Billini Hospital in Santo Domingo. She is a 37-year-old woman who three months before had an argument with a neighbor regarding Maria’s children playing in the yard. Her neighbor mixed up molasses, battery acid, Drano, and sulfuric acid in a bucket and threw it in Maria’s face. When she initially visited our clinic, she had a towel over her head, and members of our medical team sat her in a quiet corner and asked her history. She pulled back her towel, revealing horrific burns of her face, mouth, neck, chest, arm, and legs. The acid mixture had completely burned out her left eye, and distorted her face so much that her mouth was fused to her neck. 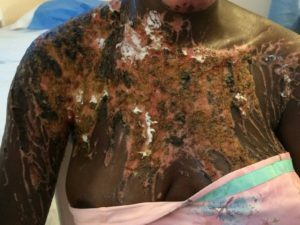 Her left breast was almost completely burnt off and she had severe burn scar contractures of her arms and hip with drip burns all the way down to her toes. As she told her story, she began to sob. She soon had us all weeping and feeling for her plight — severe physical deformities, three children, no husband, and unable to work. The next week, a team of eight operated on multiple areas, skin grafting her cheek, her lip, her neck, her arm, and part of her leg, giving her more motion. There were Dominican women knitting scarves to cover the left side of her face and we had the media report her story on the news. She has since had aid from generous fellow countrymen, and the courts are in the process of prosecuting her neighbor. We are anxiously looking forward to seeing her this coming February for more surgery. In La Paz, Bolivia this July, the physicians at the military hospital had a young student, Rynner Delgado Aguirre, waiting for Dr. Towle and his medical team. The young man had accidentally mangled his hand with fireworks so badly that there was little left of it for the medical team to work with. Our surgical team operated on the young man three times in the first two weeks, saving as many digits as possible and fixing his palm so that he would have some parts that will function and pinch, rather than having a functionless stump. The student was 21 years old and was planning on being a surgeon. The patient and his family are profoundly grateful for what the team was able to save. The young man will have more surgery by our teams in the future. Young Stalin Migulina, 4 years old, was involved in a house fire from a garage explosion and had burns over 75 percent of his body. Through some primitive but adequate care in a far-away hospital in the Dominican Republic, he survived. 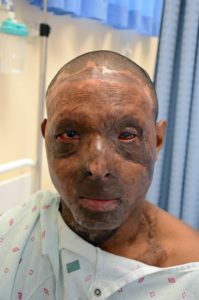 He was sent to us one month after his injuries for the repair of severe burn scar contractures that had pulled and malformed all of his extremities. We took him to the operating room but just couldn’t get an IV in because of his malnutrition and dehydration. As we took him out of the operating room and were ready to tell his mother that we couldn’t do anything but we would desperately try to help her, waiting in our clinic was Sister Babs (Beatrice Barry, founder of the Inn of the Good Samaritan), who we have worked with for the last 20 years. She knew of a local surgeon who had helped some of our patients in the past and phoned him immediately. The next day we transferred Stalin to that surgeon’s hospital, where they treated his malnutrition, took care of the non-healing burn wounds, and readied him for major surgery. Sister Babs helped us send Stalin to the Shriner’s Hospital in Boston for all of his grafting and extensive reconstructive surgery. He has had several surgeries and is now doing great. The last week of our 2007 Santo Domingo surgical mission, the schedule was completely full with no time left to help any others. With two days left, young four-month-old Ranier Antonio Pinala arrived with his mother, who was weak, sweating, and sobbing. 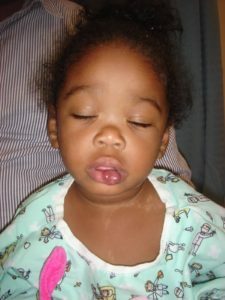 She had traveled by foot, burro, bus, and car for two days, desperate to have her boy’s cleft lip and palate repaired. She begged us to help him. Ranier was surprisingly plump and healthy, as his small family and hillside community in the far reaches of the island had sacrificed their food and money just to get him to the clinic. We couldn’t turn them away. Two days after his surgery, repairing his cleft lip and nasal deformity, we sent him back to his village with his mother who was sobbing for joy. Anna Maria Festell, a 29 year old who injured her hand 15 years ago from a machete injury while protecting herself from an assault, has had an essentially useless dominant right hand since that attack. Our expert hand surgeon and our medical team restored most of the function in her hand. Reports to us after three months show she has more than 80 percent movement of all digits. 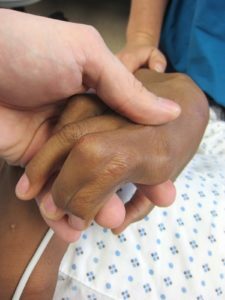 This was a seemingly impossible problem as she had little hope of ever having a useful hand until our MACLA Inc. team helped her. Alfonso Sanchez, a 36-year-old man who we originally operated on last year for severe burns, had more surgeries this year. Over 80 percent of his body was burned after his gasoline truck struck a bridge. It was amazing that he even lived through his initial injury, but because of the severity of his injuries, he has been unable to walk, move his hands, close his eyes, and open his mouth. He has been a wonderful patient who rarely complains, only wanting to be independent and use his wheelchair (which we furnished). He’s been totally dependent on family since the accident, but this year we completed the last operation on his hand to give some function so that he can steer and operate his wheelchair. Although he will never walk because of his severe burns, he can now manipulate around and even move in and out of bed by himself. His hugs, happiness, and new independence have been most fruitful. A 13-year-old girl’s mother brought her in because she had never been able to see well. She had congenital opacified, or cloudy, corneas since birth, making her vision less than 5 percent. All she needed was a routine — by American standards — corneal transplant. MACLA Inc. paid for the surgery and arranged it through an eye clinic that we knew to be reputable. Two weeks ago she had her corneal transplant and already her vision is improved to greater than 90 percent. She now sees her mother, her family, and her world. Two years ago, Jose Luis del Carmen, a 14-year-old Dominican boy, was playing on a rooftop during a storm in a remote village. A power line snapped, falling on the roof and severely burning Jose Luis on his left leg from his ankle to his groin. Eight of his villagers were in the same building and died from that accident. Jose survived this life-threatening electrical burn and for six months had no surgical care. He was sent to us over a year ago for our help. At that time we found him to be an emaciated young 14-year-old boy with anemia and a severe third degree burn of his entire left leg keeping him bedridden and on the edge of death for six months. We operated on Jose several times and transfused him, but were unable to complete his grafting because of severe bleeding. We found our liaison, Sister Babs, who is the director of the Inn of the Good Samaritan, a halfway house for the medically needy. She has brought us hundreds of patients over the years, and she knew of the only burn unit in the country that might be able to help him for long-term care. MACLA Inc. has subsequently paid for his continued education while he was still bedridden at Sister Babs’ place, and his medical care including eight operations followed by a year of rehabilitation. Jose had the greatest smile, never complained, and was determined to walk. UPDATE: Sister Babs and I met up with Jose in February of this year. After multiple operations and skin grafts, physical therapy, and convalescence, he was struggling to walk up and down stairs, but he was walking. As of last month, Jose has grown 6 inches since we first met him, wears a size 12 shoe, is 16 years old, and reads fluently. He is playing on a soccer team in his village and running around the bases playing baseball. You have helped restore his life. A 57-year-old man presented with a basketball-sized lipoma on his back, so large he couldn’t sit in a chair comfortably or sleep on his back. In gratitude for resecting the tumor, he delivered six eggs to the hospital — a healthy payment for a poor man.